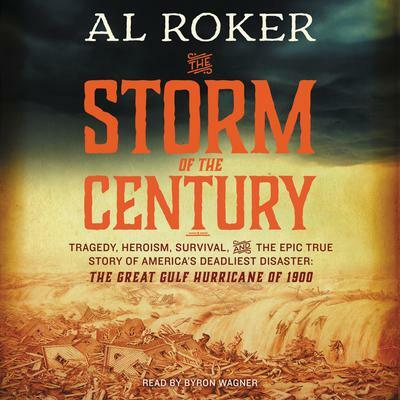 The Storm of the Century - Audiobook | Listen Instantly! Al Roker is known to over thirty million viewers for his work on NBC’s Today, a role that has earned him ten Emmy Awards. He is the New York Times bestselling author of Don’t Make Me Stop This Car! : Adventures in Fatherhood. An accomplished cook, Roker also has two bestselling cookbooks to his credit. He lives in Manhattan with his wife, two daughters, and a son. Byron Wagner is an audiobook narrator and voiceover artist based in Los Angeles. He began his career in entertainment at age eight, performing as a magician and ventriloquist for children’s parties, then graduated to theater, radio, TV, and film. After living in the UK for several years, his continuing love of acting and reading have happily led him back to the other side of the studio glass, doing voice acting and narrating, directing, and producing audiobooks.